Please make a note of vertical clearance requirements for each type of service. Permanent service poles are the property of Lane Electric. Lane Electric will install and maintain the poles and guy wires. Temporary pole should be located 10 feet to 20 feet from transformer pole or as specified by the Cooperative. 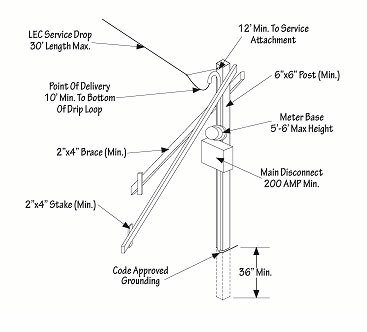 Consumer shall supply temporary pole, meter base, mast with weather head, main disconnect, and grounds to National Electric Code (NEC) construction code specifications. The Cooperative will provide maximum 20-foot service drop and install meter. Energizing of consumer’s service is contingent upon an approved State or City electrical inspection. Before you dig, call the Utility Notification Center at 811 or (800) 332-2344 at least 48 hours in advance.